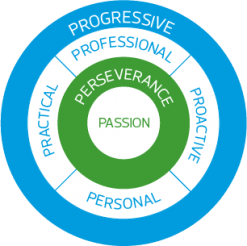 Passion - This is the core of our value system - the passion to want to help growing businesses, and to excel in whatever we do for the benefit of our clients. Proactive - We make things happen instead of waiting for things to happen. We tap on our expertise and experience to anticipate issues and problems for clients. Practical - We do not believe in textbook solutions. We are involved with the client in the implementation of our recommendations, which are guided by practicality and cost-effectiveness. Personal - Clients should feel free to talk to us, anytime. We offer a higher level of managerial and partner attention. Perseverance - Solutions are not always straightforward for challenges facing growing businesses. We adopt a dogged attitude and will explore all avenues to help clients overcome their difficulties or achieve set objectives. We hand-hold and help them through all odds. Progressive - Keeping up-to-date with work methodologies, knowledge and skills is key to our HR development policy. Professional - We uphold the reputation of the profession and the company through proper conduct and quality work at all times. Our commitment to quality was further endorsed in 1997 when we were ISO certified, being the first accounting firm in Singapore to do so. The certification reinforces and embeds quality into our operations and way of life.